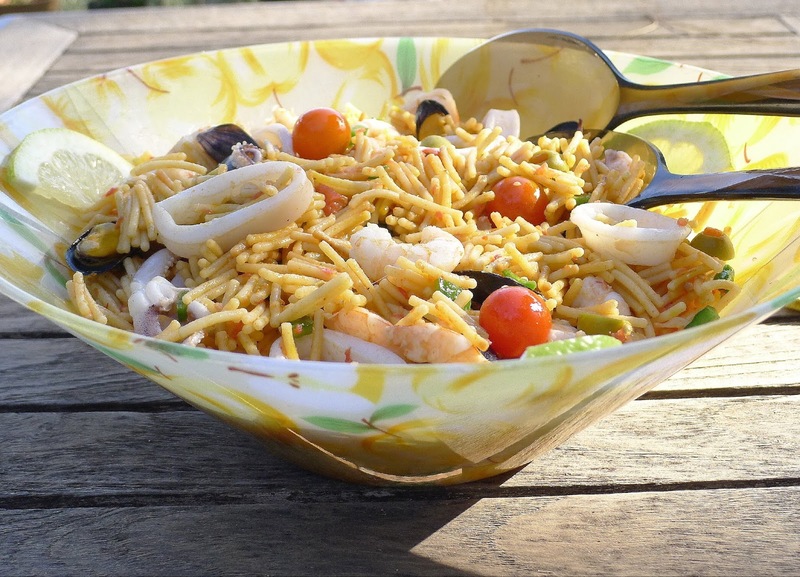 NOODLE SALAD IS SO COOL! I love Asian cold noodle salads—gingery, chile-flecked tofu with rice noodles or fish in peanut-coconut milk sauce and udon (wheat) noodles. They seem to cut through hot-weather stickiness. 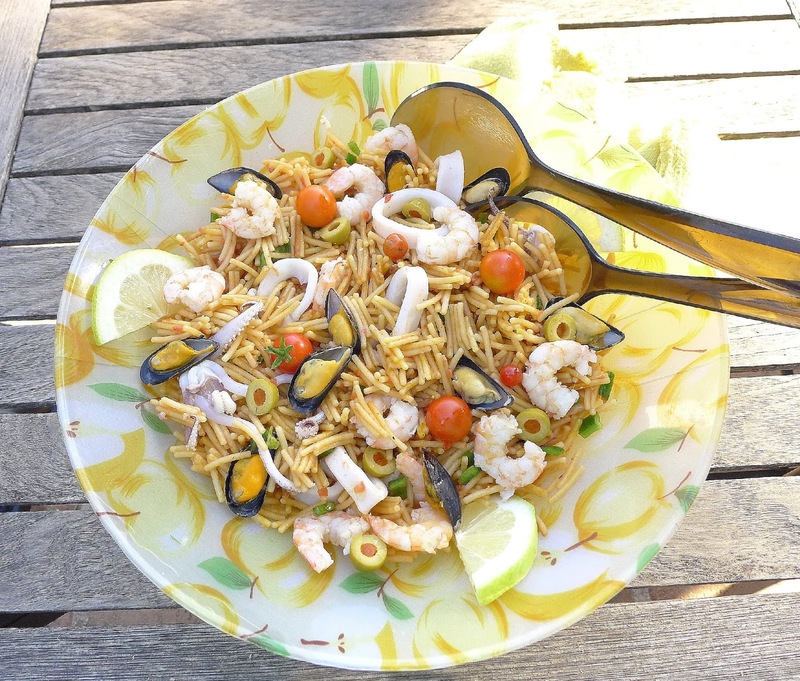 While forking (or chopsticking) a cool noodle salad, I thought, why not try a Spanish-style noodle salad? 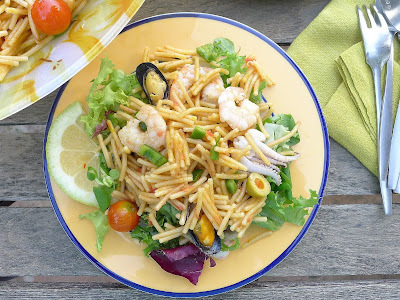 Thus was invented cold Ensalada de Fideuá con Gambas—noodle-shrimp salad. Big bowl of fideo noodle salad, with shrimp, squid (and a few mussels--I ate most of them the minute they were steamed). 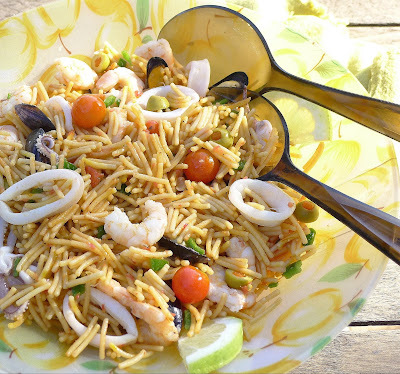 Fideuá, or fideos, are vermicelli noodles. They come in various thicknesses, from fine angel’s hair to those about the same thickness as spaghetti. They may be long strands, bundled into “nests,” or more usually, cut into short lengths, ready for adding to a pot of noodle soup. One variety has a pinhole through the pasta. 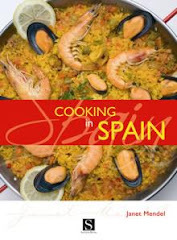 They are perfect for making fideuá, a pasta-paella well-known in Catalonia and Valencia regions. That’s the inspiration for this salad. If you can’t get real fideos, use spaghetti broken into short lengths. The Spanish technique for cooking pasta is to fry it first, then add sofrito and flavorful stock to finish the cooking. That’s pretty much how I made the noodles for the salad, only, instead of making a sofrito, I added raw tomatoes and chopped peppers to the cooked noodles. The shrimp stock is essential for flavoring the pasta. 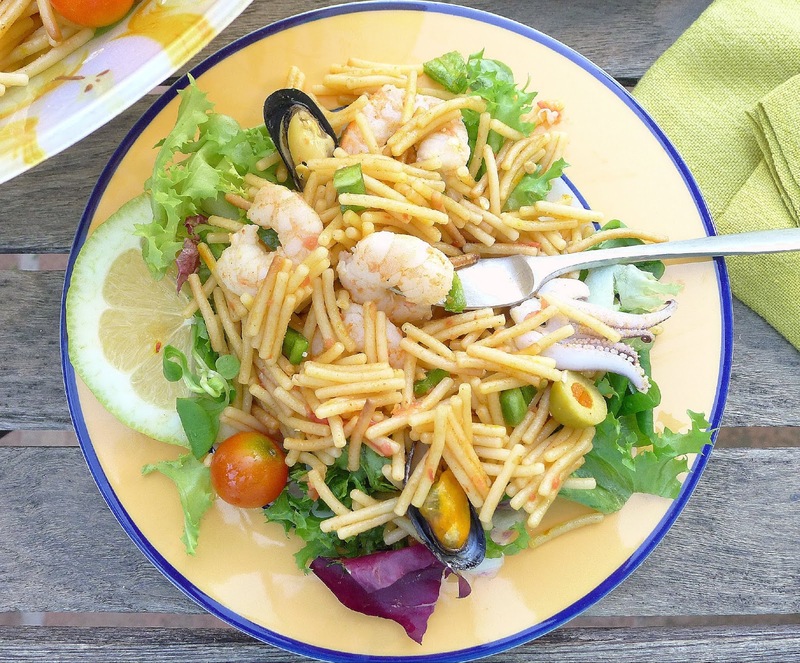 If you can’t get shrimp with heads and shells, try substituting other crustacean shells—lobster or crab, for example. Otherwise, use fish stock or clam broth. The recipe for shrimp stock (below) makes more than you need for the noodle salad, so, once cooled, freeze the remainder for another use (or, the next pasta salad). 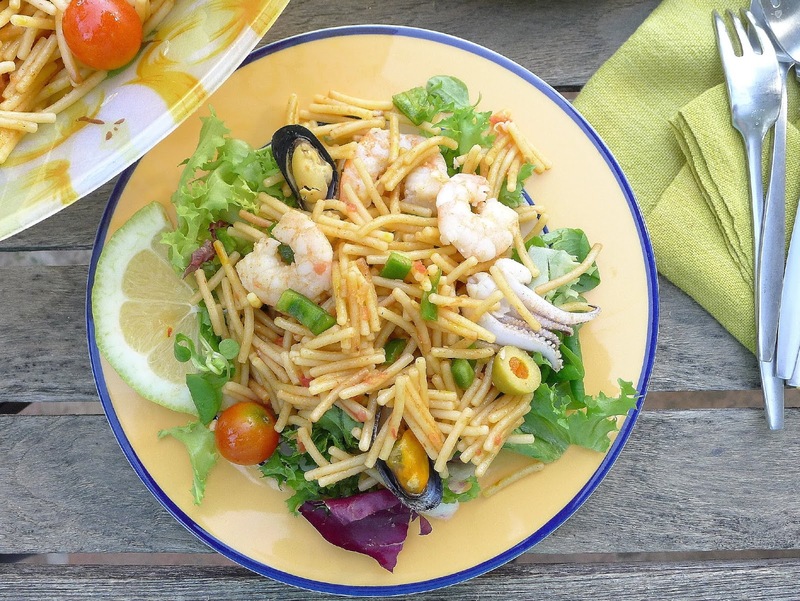 The salad can be prepared in several easy stages—first the stock, then the cooking of shrimp and squid and, finally, finishing the salad. Noodles cooked in shrimp stock are packed with flavor. 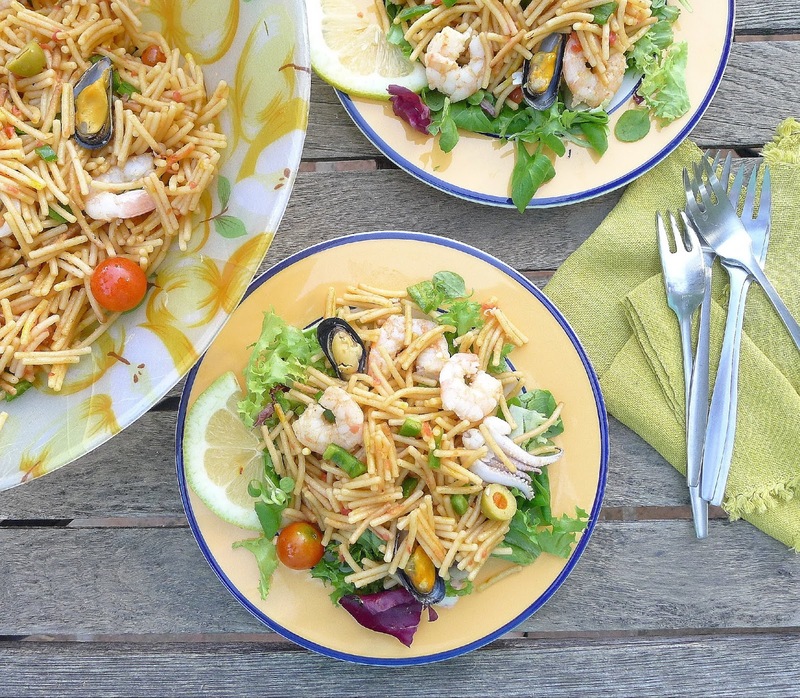 Serve the noodle salad as a starter or main. Garnish with olives and cherry tomatoes. Shell the shrimp, reserving the bodies, refrigerated, for the salad. Heat the oil in a soup pot and add the heads and shells. Fry them 4 minutes. Lightly crush the garlic and add it, unpeeled to the pot. Stir in the pimentón and chile and immediately add the water. Add lemon slice, salt, vinegar, bay and parsley. Bring to a boil, reduce heat and cook, partially covered, 20 minutes. Bring a small pan of salted water or stock to a boil. (Use enough to just cover the shrimp.) Have ready a bowl of ice water. Add the shrimp to the boiling water and cook them until they turn pink and curl slightly, 2 to 4 minutes. Drain the shrimp and plunge them into the ice water. Add the pieces of squid to the boiling water just until they turn opaque, 20 seconds. Drain and add them to the ice water. 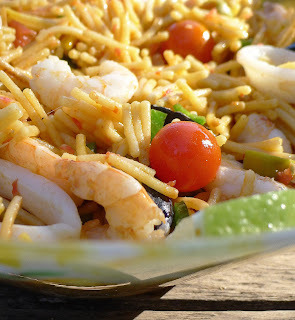 Drain the shrimp and squid and refrigerate them, covered, until ready to incorporate in the noodle salad. Toast the noodles with a little olive oil until golden-brown. In a deep skillet, heat 2 tablespoons of the oil. 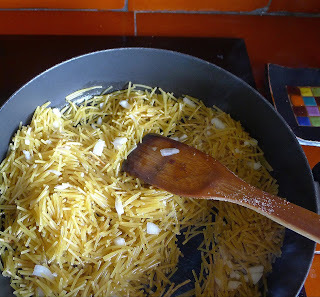 Add the fideo noodles and chopped onion and toast them, stirring, until the noodles begin to turn golden, about 4 minutes. Add the saffron, if using. Add 3 cups of the shrimp stock and cook the noodles on a medium-high heat until they begin to stick, 5 minutes. Add remaining 1 cup of stock, lower the heat and cook, stirring occasionally, until noodles are al dente, about 5 minutes more. Remove the skillet from the heat. Noodles will still be juicy, but not soupy. Cover and let them set 10 minutes. Immediately before serving, add the shrimp and squid to the noodles. Garnish the salad with olives, cherry tomatoes and sliced lemon. Serve with salad greens, if desired. A recipe for fideuá is here. My son Daniel and his wife Eli, who recently moved into a big house near Atlanta, Georgia, enjoy big Sunday afternoon open house parties. The kitchen is the hub of the house. I think they chose the place especially for the kitchen with granite-topped center island. 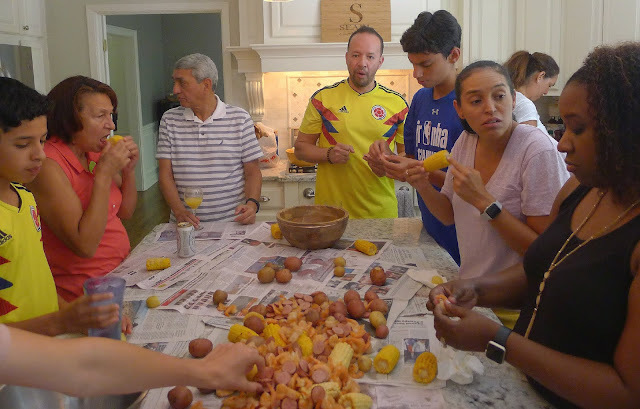 Family and friends gather in the kitchen (it was raining outside) to peel and eat shrimp, sausage, potatoes and corn. 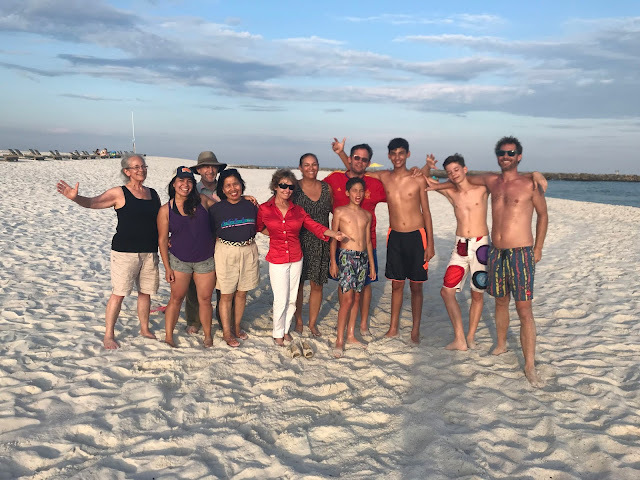 The tall kid in the blue t-shirt is my 13-year-old grandson, Lucas. He loves shrimp! That’s where Daniel spreads the contents of an enormous pot of Low Country Boil—shrimp, sausage, corn and potatoes cooked in a spicy broth. Guests gather around to peel and eat the shrimp. 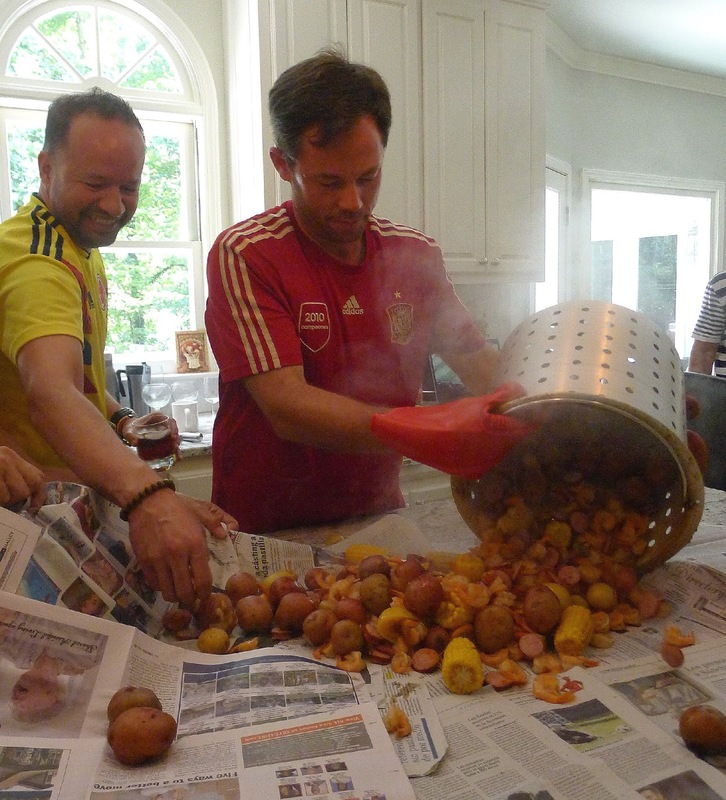 We had Low Country Shrimp boil twice while I was visiting, first for the day Spain lost to Russia in the World Cup (sadly) and again for the World Cup final, won by France (yay). 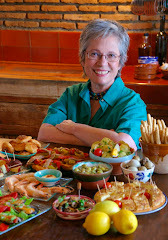 I made Andalusian gazpacho for friends and family to sip while the great pot boiled. Daniel lifts steaming basket out of the boiling pot. Spread out on the kitchen's center island, shrimp boil is a hands-on feast. Shrimp, sausage, potatoes and corn--a meal in a pot. The gazpacho gave me the idea to try a shrimp boil back here on the Costa del Sol. I had to make a few substitutions and adaptations. 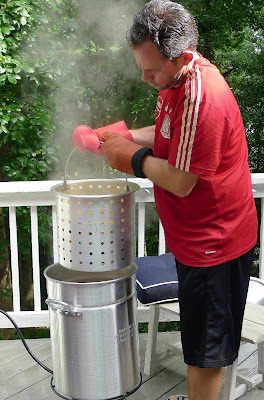 Without that huge pot with slotted basket (it came with a gas-fired ring for cooking on the deck), I couldn’t really prepare a boil for upwards of a dozen people in my kitchen. But, using my largest stainless-steel stock pot, I made a pretty good spread for four to six guests. Here’s how. SHRIMP (gambas, langostinos, gambones, prawns). The ones we had in Georgia were raw, frozen, shells-on, no heads. They magically split open in boiling, making them super-easy to peel. In Spain, I bought frozen jumbo shrimp with shells and heads and removed the heads. Sorry to report, they did not split open—but hands-on shelling is part of the messy fun of this meal. SAUSAGE. 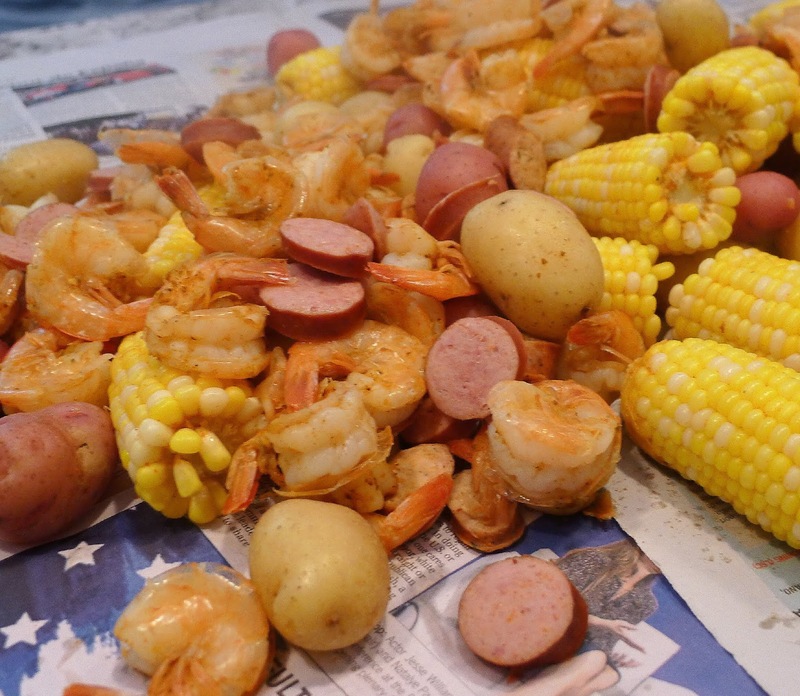 A typical low-country boil, depending on whose low country it is (Georgia, Carolina or Louisiana), contains smoked kielbasa sausage and/or spicy andouille. In Spain I chose chorizo picante, a spicy red chorizo that is made with smoked pimentón, and bockwurst, a smoked sausage. Slice the sausages before adding to the pot. 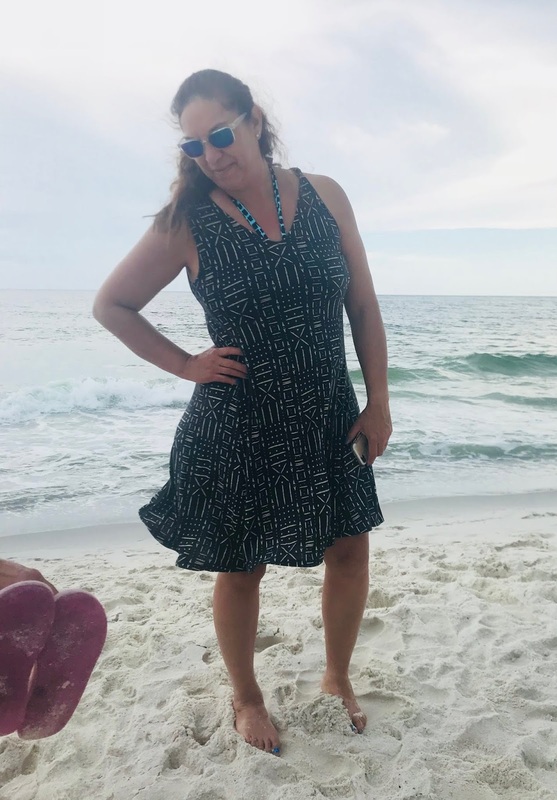 America in summer! Corn on the cob is a delight. CORN. On the cob, Cut ears in half before adding to boil. POTATOES. Use small red and yellow potatoes. They need to fully cook in the approximately 25 minutes of boiling. SPICES AND HERBS. 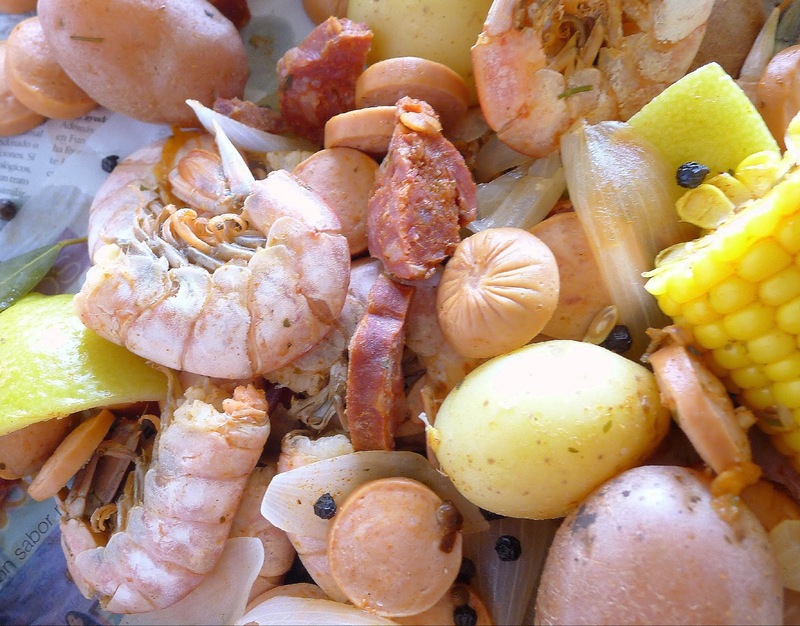 In Georgia we used packaged spice blends especially for shrimp and crab boils. There are various brands and mixes, usually with paprika, cayenne, garlic plus “spices.” The unnamed secret spices may include coriander, mustard, ginger, mace, allspice. Some, but not all, include salt and MSG. 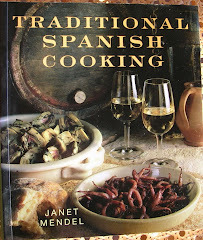 At my local market, I bought a spice blend for making gambas al pil pil (sizzling shrimp, also known as gambas al ajillo). It contains pimentón (paprika), salt, garlic, cayenne, parsley, bay, black pepper, thyme and cumin plus potenciador del sabor. Yes, “flavor enhancer” is MSG. If you like really spicy-hot flavors, add lots of the spice blend. FLAVORINGS. Salt is essential. I suggest you taste the liquid after adding spices and salt. Add more if needed. Lemon, onion, garlic, bay leaves, peppercorns and beer are other suggested additions. SERVING. Drain the ingredients (that’s where the perforated basket is useful—you just lift it out of the big pot). Otherwise, use a big colander. 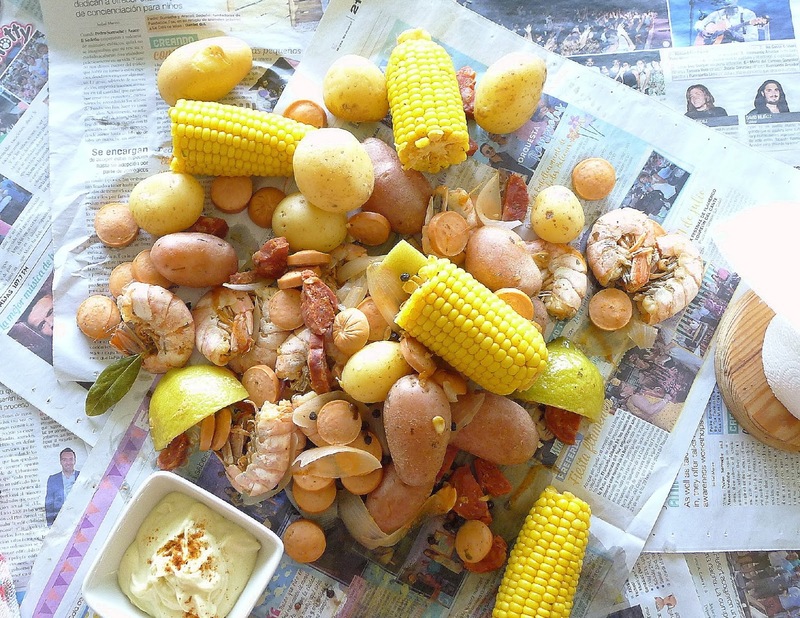 Indoors or outdoors, spread a table with newspaper and dump the shrimp, potatoes, corn and sausages out. 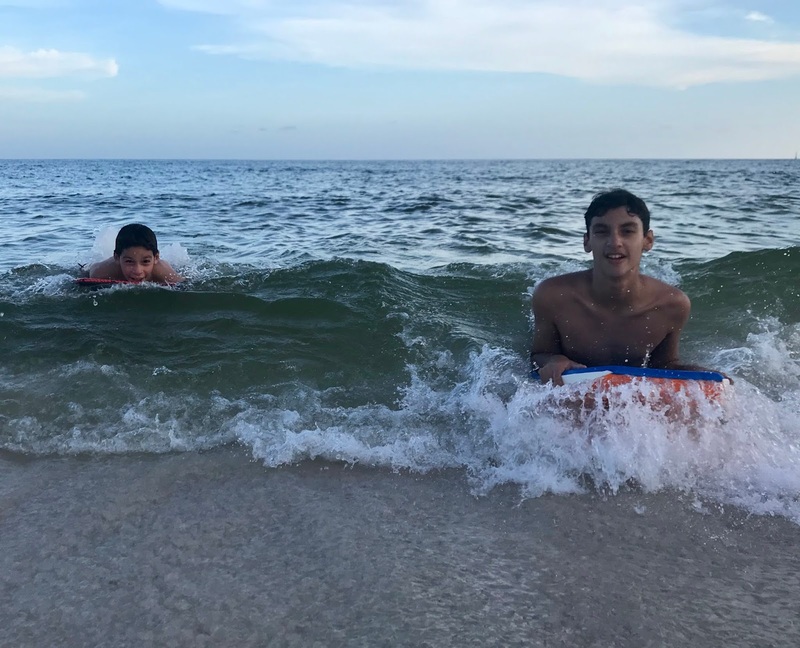 Provide paper towels and bowls for shells and corn cobs. 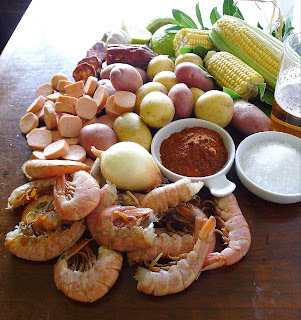 Icy-cold beer and Spanish cava go great with shrimp boil. Dipping sauce is optional. 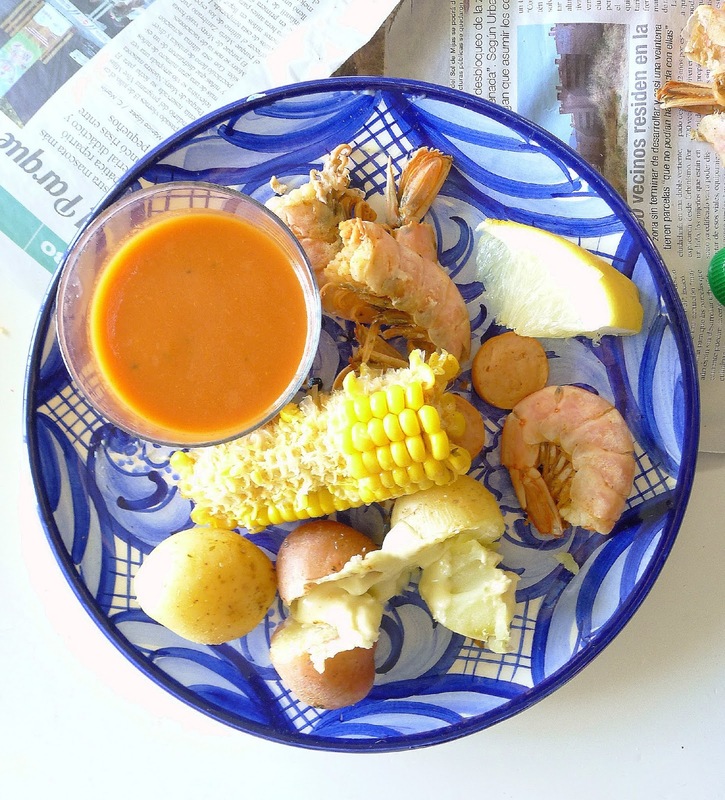 At home on the Costa del Sol--a shrimp boil with a few substitutions. Dipping sauce is made by blending the cooked garlic cloves with mayonnaise, olive oil and lemon juice. It's great with the potatoes and corn. A la española-- shrimp boil with a side of gazpacho. 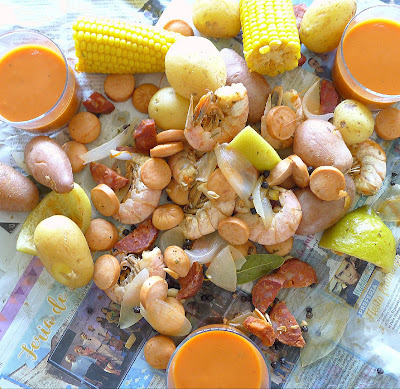 Andalusian gazpacho pairs perfectly with low country boil of shrimp, sausage, potatoes and corn. Place water and beer in a large pot. Add salt, spice blend, lemon and bay leaves. Bring to a rolling boil. (Taste the liquid for salt and spice.) Add the potatoes, onion and garlic. Moderate heat so water continues to boil gently. Cook 8 minutes. Add sausage. Keep water bubbling and cook 5 minutes. Add corn. Cook 8 minutes. Test the potatoes with a skewer to see if they are tender. If they’re ready, add shrimp. Cook 3 minutes. Remove pot from heat. Use a large colander to drain off water. Serve the shrimp and other ingredients on a large platter or spread out on newspapers. Another sauce that would go well with the shrimp boil, Romesco. Recipe for Sizzling Shrimp (Pil Pil). A week at the beach! But not the Costa del Sol, where I live. 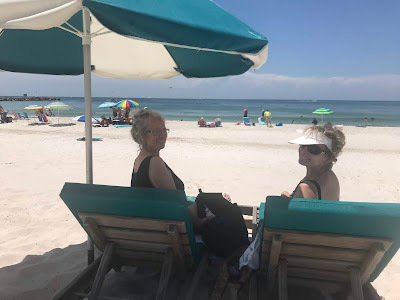 We're at Orange Beach, Alabama, for a grand family reunion. With 12 people in two condos overlooking the Gulf of Mexico, we are keeping two kitchens in near-constant operation. Lots of gazpacho for steamy-hot days. 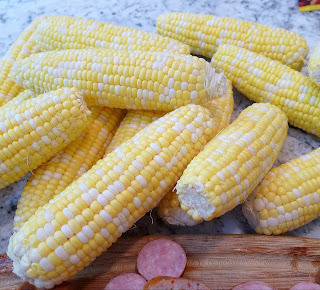 Corn-on-the-cob with olive oil. Grilled steaks. 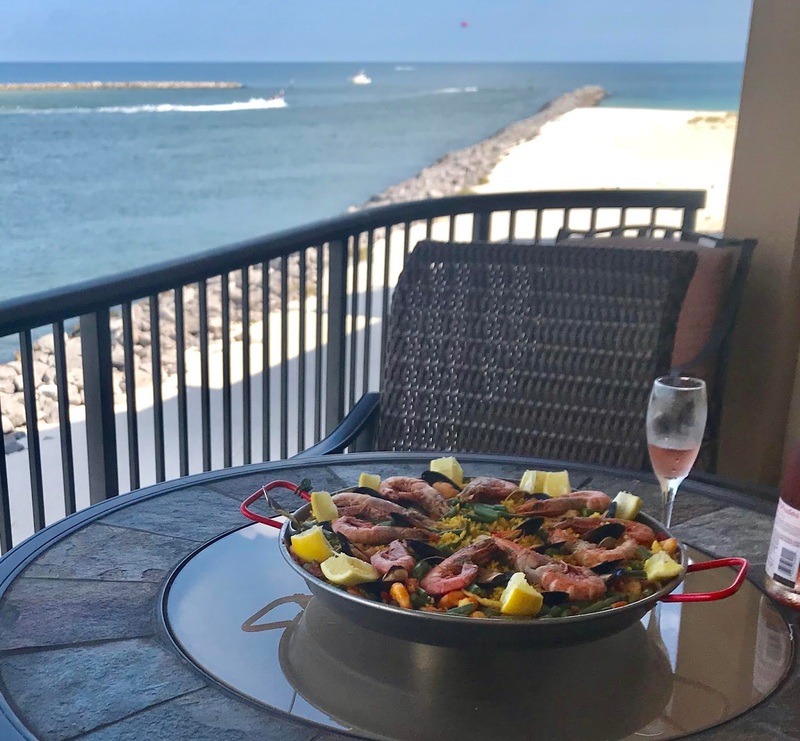 And, of course, paella for the whole gang. 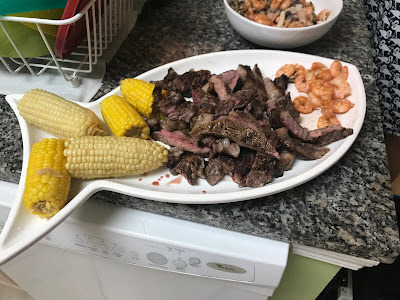 Surf 'n turf--boneless ribeye steaks, medium rare, with Gulf shrimp and corn cooked with Louisiana shrimp-boil spices. Family reunion on the beach. With Elaine on the beach. 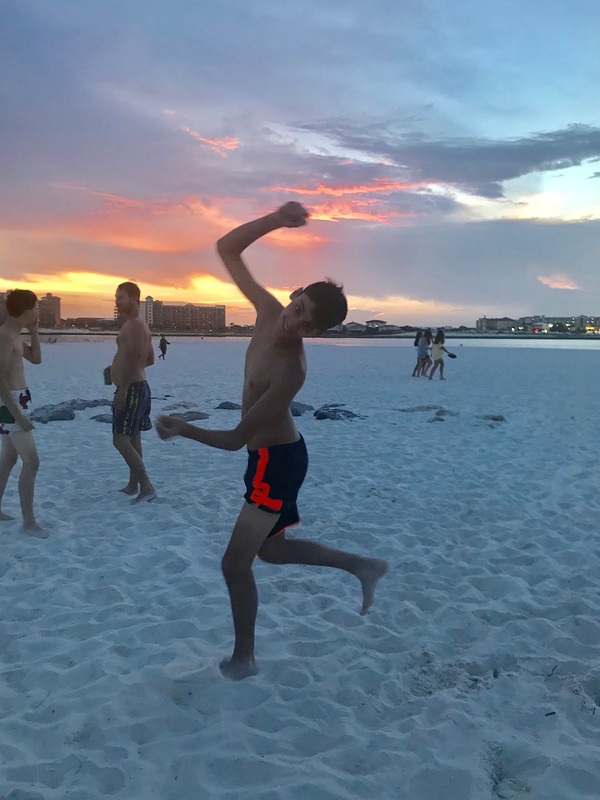 Lucas at sundown, doing the dance. 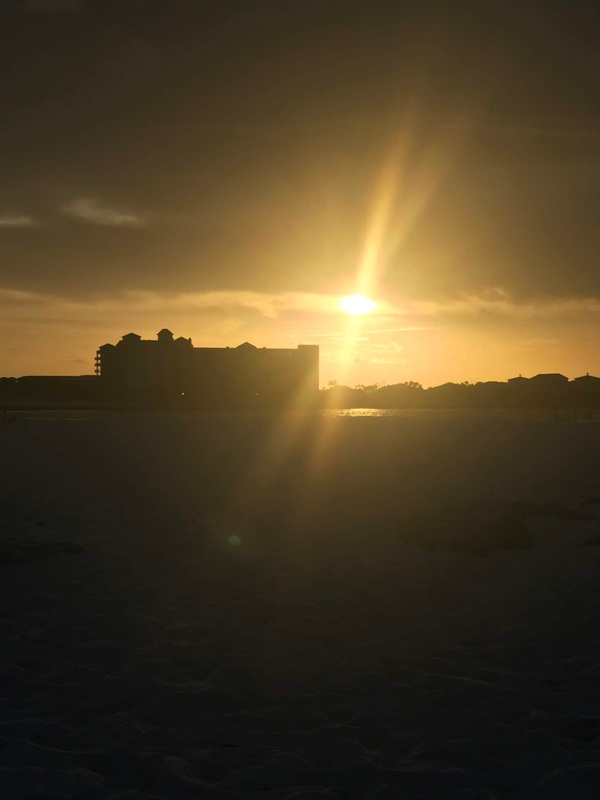 Sundown. What's for dinner tonight? Maybe Gulf red snapper, locally caught. 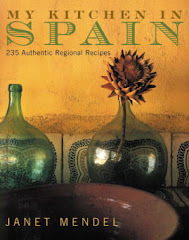 In my book, TAPAS—A BITE OF SPAIN (Santana Books, 2008), I have a whole chapter devoted to fritos, tapas from the frying pan. 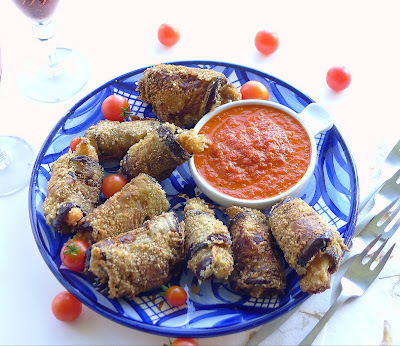 I've very nearly worked my way through the 24 recipes for fried foods in this blog—with three just in the past few weeks. 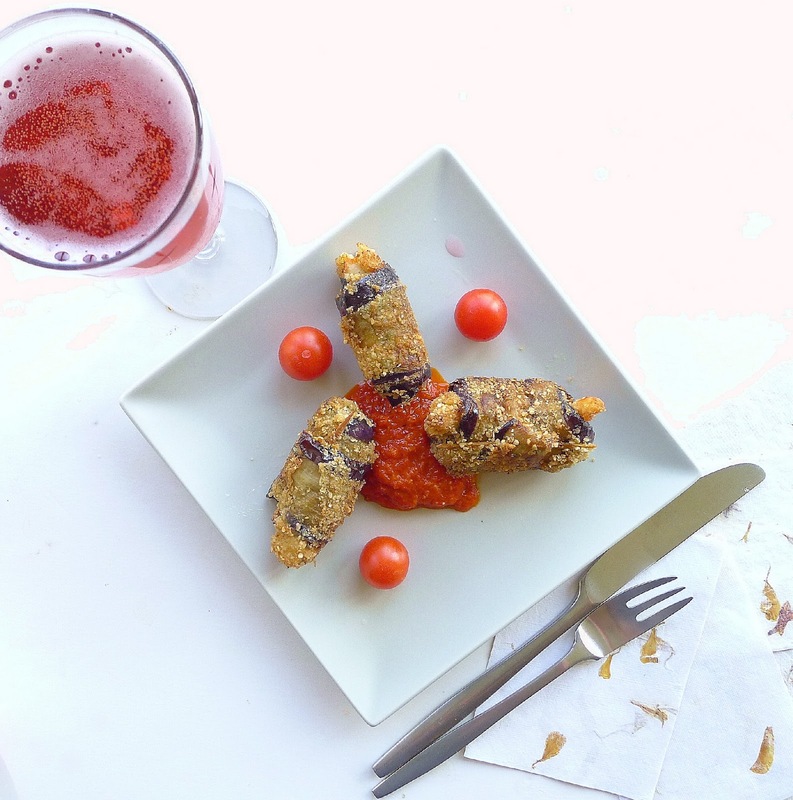 Fried foods are the irresistible stars of many tapa bars. They appeal to all the senses, go with every drink. Genuine crowd pleasers, fried foods are worth adding to your tapas repertory. So, here’s one more before I turn my attention to gazpacho and salads. These are rolls of thinly sliced eggplant wrapped around jumbo shrimp. 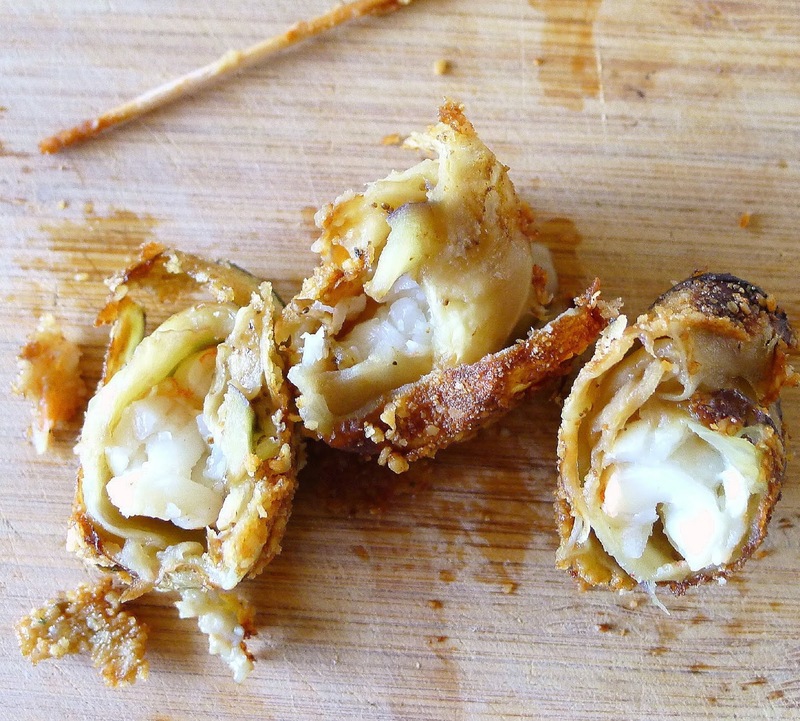 Fasten the rolls with toothpicks, dip them in egg and breadcrumbs and pan fry them until golden. 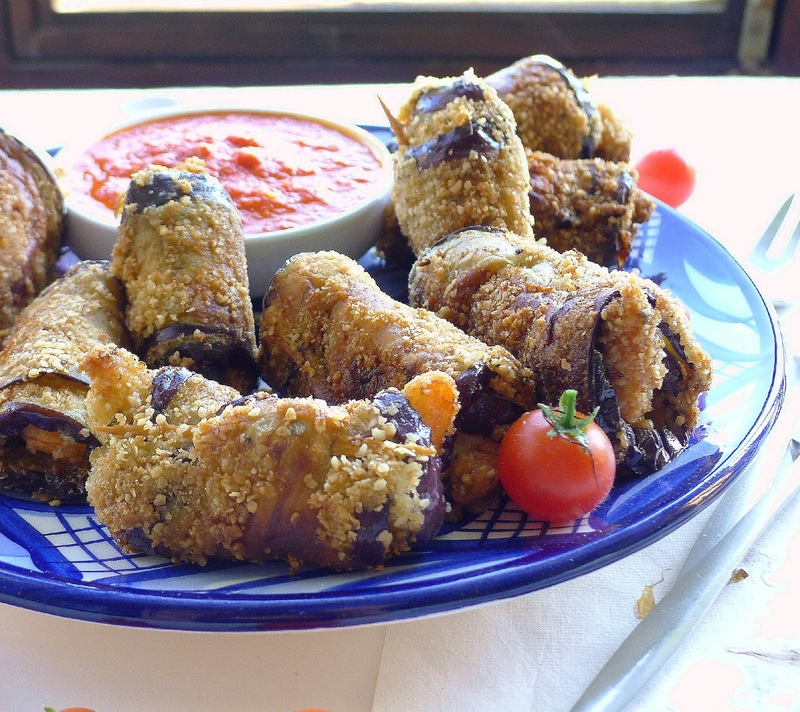 Crisp on the outside, the eggplant makes a creamy layer encasing the shrimp. These savory tidbits are good with a sauce such as piquillo pepper sauce or garlic mayonnaise with saffron. Serve them as finger foods at a drinks party or as a starter. Crispy rolls of eggplant wrapped around jumbo .shrimp, with piquillo pepper sauce for dipping. Serve the rolls as finger food or, plated, as a starter. 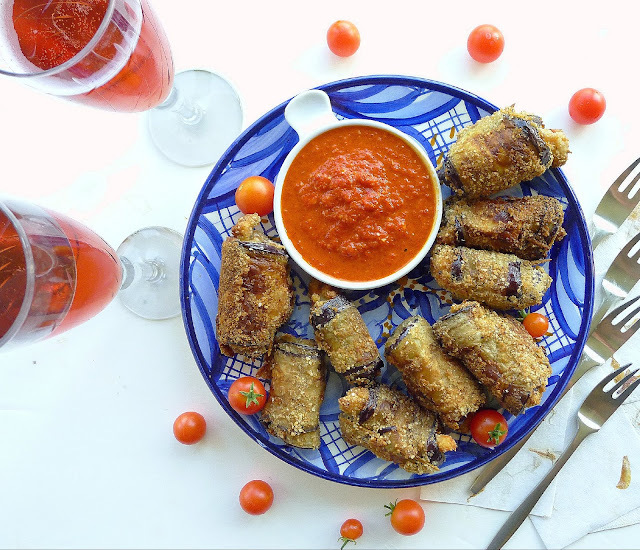 In the pink--bubbly vino rosado, either cava or vino de aguja, is perfect with summer tapas. 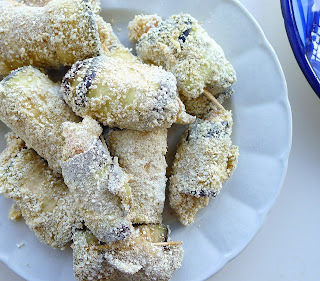 Salting and draining the eggplant slices softens them so it's easy to roll them around the shrimp. Don't let the oil get too hot when frying the rolls. 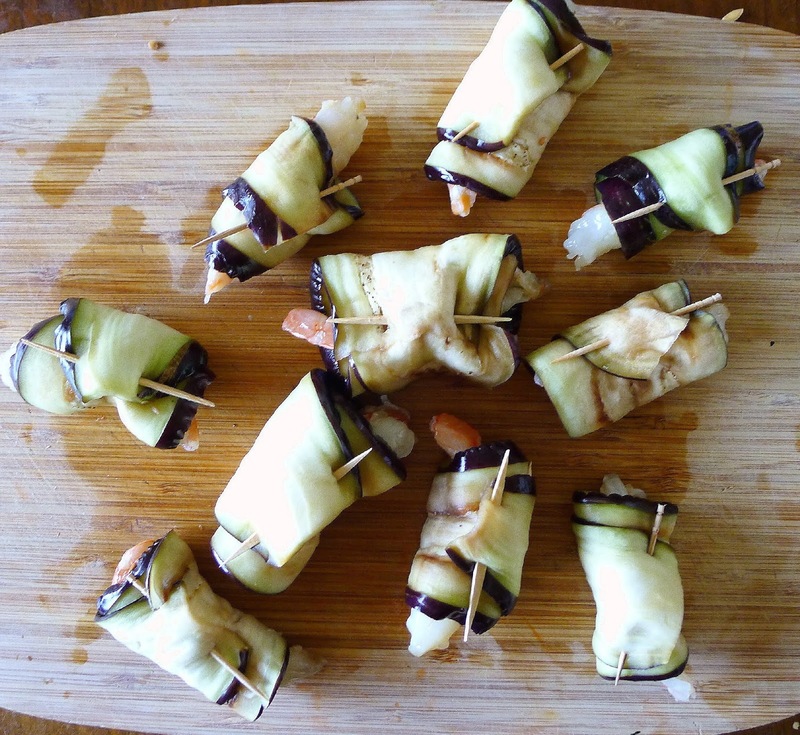 You want to let the shrimp and eggplant cook through in the time it takes to brown the outside of the rolls. 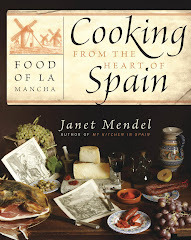 Makes 12 tapas or 4 starters. 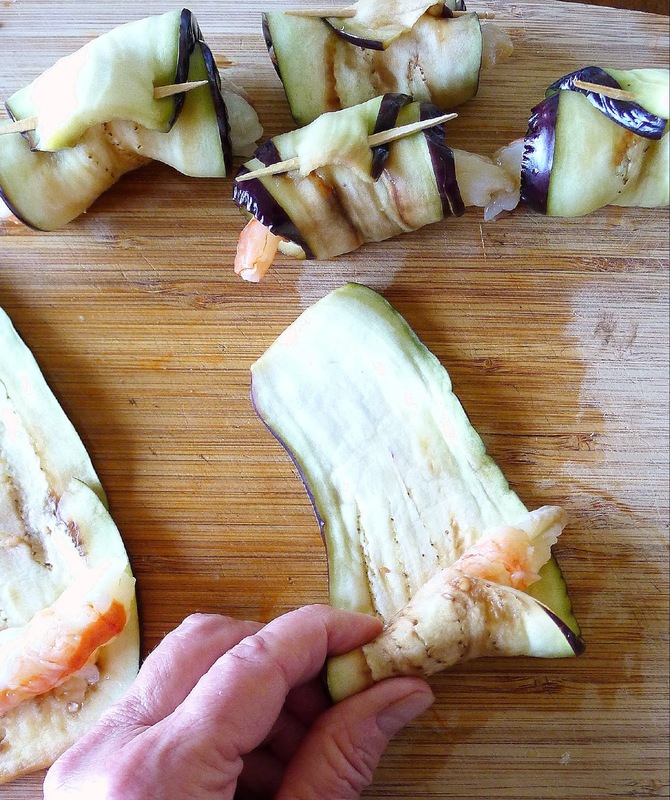 Place shrimp on eggplant slice and roll it up. Cut off and discard the eggplant stem. Slice the eggplant lengthwise very thinly (1/8 inch), discarding 2 outer slices with skin. You should have 12 slices. Place the slices in a colander and sprinkle liberally with salt. Allow to stand for 45 minutes. Pat the eggplant dry with paper towels. Place a shrimp across the wide end of a slice and roll up the eggplant around the prawn. Fasten the roll with a toothpick. Rolls fastened with picks are ready to be breaded and fried. Ready for frying in hot olive oil. Fry the rolls slowly so the shrimp cook in the time it takes for the exterior to brown. Add oil to a frying pan to a depth of at least ¼ inch. Heat the oil on medium heat until it is shimmering, but not smoking. Fry the rolls, a few at a time, until they are browned on all sides, 6 to 8 minutes total. Remove and drain on paper towels. Serve immediately. 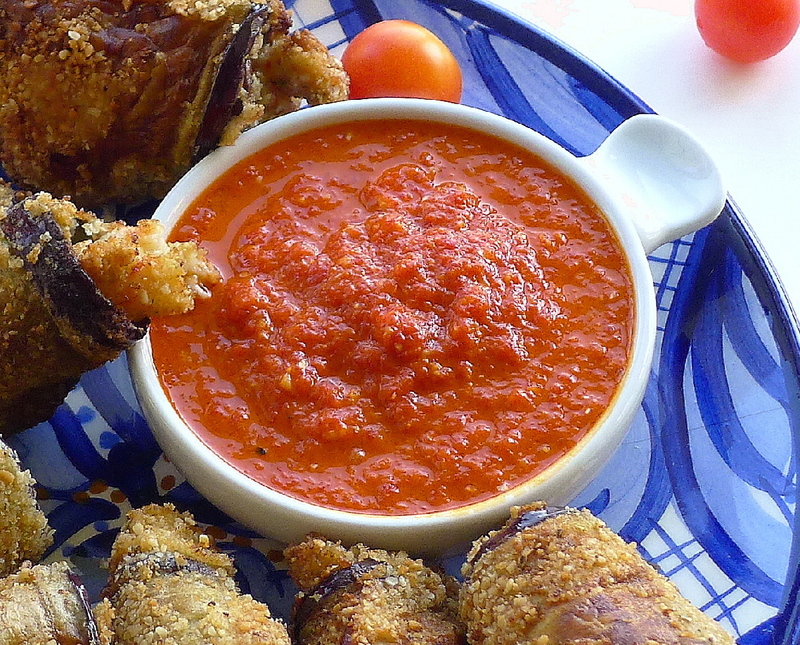 Piquillo pepper sauce goes with fried and grilled foods. This is a sensational dipping sauce or a dressing for vegetables or prawns. And it’s ever so simple. The flavor comes from those special peppers, tiny red piquillos from Navarra, that are sweet and piquant at the same time. They are roasted, peeled and packed in tins. All you have to do is open the tin or jar, put the piquillos in a blender with some olive oil. How hard is that? You can add a pinch of thyme or cumin or chopped chile, if you like it “hot. If you want a warm sauce to serve with hot foods, just heat the sauce gently in a small saucepan. Combine the peppers, garlic, oil, vinegar and salt in a blender or food processor. Blend to make a smooth purée. Serve immediately or refrigerate, covered, up to one week. 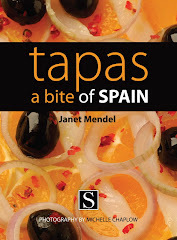 To order TAPAS--A BITE OF SPAIN from Amazon España. Flouncy Fried Pork Rolls (Flamenquines). Fried Potatoes with Spicy Sauce (Bravas). Stuffed and Fried Chard Stems.